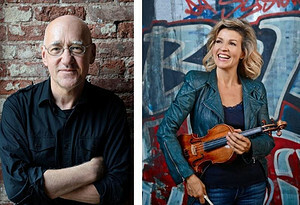 NEW YORK, NEW YORK (February 11, 2019) — Composer Sebastian Currier’s Ghost Trio, written for violinist and longtime champion of his music Anne-Sophie Mutter, receives its world premiere at Carnegie Hall on Tuesday, March 12 at 8:00 p.m. Performed by Ms. Mutter with cellist Daniel Müller-Schott and pianist Lambert Orkis, the work is a piano trio that explores the history and legacy of the genre through allusions to classic works. Ms. Mutter, Mr. Müller-Schott, and Mr. Orkis reprise the work at Chicago’s Symphony Center on Sunday, March 17 at 3:00 p.m. The New York program also features Debussy’s Violin Sonata and Mozart’s Violin Sonata in B-flat Major, K. 454, while the Chicago program includes Ravel’s Violin Sonata and Beethoven’s Piano Trio in D Major, Op. 70, No. 1 (“Ghost”). Both programs feature Mozart’s Violin Sonata in E Minor, K. 304 and Poulenc’s Violin Sonata. Tickets for the New York concert, priced $20 to $131, are available at the Carnegie Hall Box Office, 154 West 57th Street, or can be charged to major credit cards by calling CarnegieCharge at 212-247-7800 or by visiting the Carnegie Hall website, carnegiehall.org. Tickets for all Symphony Center Presents Chamber Music series concerts can be purchased by phone at 800-223-7114 or 312-294-3000, online at cso.orgor at the Symphony Center box office: 220 S. Michigan Ave., Chicago, IL 60604. Mr. Currier’s Aftersong (1994) has been performed by Ms. Mutter extensively in the US and Europe, including at Carnegie Hall, London’s Barbican, and Salzburg’s Grosses Festspielhaus. She premiered and recorded Time Machines (2007) with the New York Philharmonic led by Alan Gilbert, and premiered Ringtone Variations (2011) with Roman Patkoló, with whom she also performed the U.S. premiere at Carnegie Hall. Most recently at Carnegie Hall, in April 2017, Ms. Mutter performed Mr. Currier’s Clockwork (1989) with Lambert Orkis. This season, in addition to Ghost Trio, world premieres by Mr. Currier include a violin concerto (Aether) co-commissioned by the Boston Symphony Orchestra and Leipzig Gewandhaus Orchestra, to be premiered in May with Baiba Skride as soloist and Andris Nelsons conducting, and a chamber commission (Eleven Moons) from Boston Musica Viva, which was premiered on February 2. His compositions have been performed at major venues worldwide by leading artists and ensembles, including violinist Anne-Sophie Mutter, violist Kim Kashkashian, guitarist Eliot Fisk, and pianist Inon Barnatan; such orchestras as the Berlin and New York Philharmonics, the Boston, Cincinnati, National, and San Francisco Symphonies, and the BBC Wales, Concertgebouw, Leipzig Gewandhaus, Minnesota, and NCPA (Beijing) Orchestras; and chamber and choral groups including the American Brass Quintet, The Crossing, and Kronos Quartet. Recent projects include RE-FORMATION, a large-scale work for chorus and orchestra whose world premiere by the Minnesota Orchestra under Music Director Osmo Vänskä was included among The New York Times’ “Best Classical Music Performances of 2017”; Blake Fragments, commissioned by Works and Process and premiered at the Guggenheim Museum by the Vox Vocal Ensemble; Etudes and Lullabies, which was first performed by the Borromeo String Quartet at Carnegie Hall’s Weill Recital Hall, the Orion String Quartet at the Chamber Music Society of Lincoln Center, and the Verona Quartet at the Chelsea Music Festival; and Glow, a solo piano piece premiered at the Aspen Music Festival by Inon Barnatan, who later gave the UK premiere at Wigmore Hall. Divisions was premiered four seasons ago by the Seattle Symphony under Ludovic Morlot and subsequently performed by the Boston Symphony under Andris Nelsons both in Boston (Symphony Hall) and New York (Carnegie Hall). This season’s performances by the Detroit Symphony Orchestra are also conducted by Mr. Morlot. His Microsymph, which he describes as a large-scale symphony compressed into ten minutes, was commissioned by the American Composers Orchestra and premiered at Carnegie Hall. It has also been performed by such orchestras as the BBC National Orchestra of Wales, Leipzig Gewandhaus Orchestra, National Symphony Orchestra, and San Francisco Symphony, and has been recorded by the Frankfurt Radio Orchestra with conductor Hugh Wolff. His discography includes recordings of his Time Machines with Anne-Sophie Mutter and the New York Philharmonic for Deutsche Grammophon, FLEX with the Cincinnati Symphony for the Fanfare Cincinnati label, Next Atlantis with the Ying Quartet on Naxos, Quartetset and Quiet Time recorded together by the Cassatt Quartet for New World Records, Scarlatti Cadences on pianist Joyce Yang’s album Collage for Avie Records, Cadence, Fugue, Fade on the American Brass Quintet’s Perspectives album for Summit Records, and an album on Koch International Classics titled “On the Verge,” which features Music from Copland House performing his Grawemeyer Award-winning Staticand other chamber works. Most recently, his Microsymph was recorded by the Oregon Symphony. Among his many prestigious honors and awards are the Berlin Prize, Rome Prize, a Guggenheim Fellowship, a fellowship from the National Endowment for the Arts, and an Academy Award from the American Academy of Arts and Letters. He has also held residencies at the MacDowell and Yaddo colonies. He receiaved a DMA from the Juilliard School and taught at Columbia University from 1999 to 2007. He was Artist in Residence at the Institute for Advanced Study in Princeton, New Jersey, from 2013 to 2016. Anne-Sophie Mutter is a musical phenomenon and virtuoso who, for more than 40 years, has been a fixture in all the world’s major concert halls, making her mark in classical music as a soloist, mentor and visionary. Since her recital debut at the 1976 Lucerne Festival and solo debut with the Berliner Philharmoniker under Herbert von Karajan at the 1977 Salzburg Whitsun Festival, Ms. Mutter has frequently performed with the world’s greatest orchestras, including the Berliner Philharmoniker, Boston Symphony, Gewandhaus Orchestra, New York Philharmonic, Chicago Symphony Orchestra, Orchestre de Paris, London Symphony Orchestra, and Bavarian Radio Symphony Orchestra, and has collaborated with the most prominent composers and musicians of our time. Ms. Mutter is as equally committed to the great canonical works as to the future of music, and has given the world premieres of 26 works, many written for her, by composers including Unsuk Chin, Sebastian Currier, Henri Dutilleux, Sofia Gubaidulina, Witold Lutoslawski, Norbert Moret, Krzysztof Penderecki, Sir André Previn, Wolfgang Rihm and more. Following her North American recital tour in March 2019, Ms. Mutter will join the Chamber Orchestra Vienna-Berlin in an extensive tour of Central and Western Europe in May and June 2019, playing Mozart’s Violin Concertos with concerts in Germany, Spain, Greece, and others. Later in June 2019, she will reunite with the Chamber Orchestra Vienna-Berlin for a performance at the Segerstrom Center for the Arts in California on June 25, again featuring the Mozart Concertos. In July 2019, Ms. Mutter will return to the Tanglewood Festival for a weekend of two special concerts including a celebration of André Previn's 90th birthday, and the first complete performance of Across the Stars, a program of new arrangements of film scores prepared especially for her by John Williams, including Star Wars, Schindler's List, Memoirs of a Geisha, Munich, and more. These selections will be featured on her forthcoming album, Across The Stars, due out this summer. She will reprise the program in September at Munich's Königsplatz, marking her first-ever open air concert. Dedicated to fostering the careers of emerging musicians, Ms. Mutter founded the “Association of Friends of the Anne-Sophie Mutter Foundation e.V.” in 1997, to which the Anne-Sophie Mutter Foundation was added in 2008. Since 2011, she has regularly shared the spotlight on stage with the foundation’s exclusive ensemble of fellows, The Mutter Virtuosi. She has featured them in recordings, including Vivaldi’s Four Seasons,andSchubert’s “Trout” Quintet with Daniil Trifonov. The four-time Grammy® Award winner has received several international awards and honors, including the Polish Gold Medal for Merit to Culture, the Bavarian State Foundation Culture Prize, the Romanian Order of Cultural Merit in the rank of Grand Officer, the insignia of a Commander of the French Order of Arts and Literature, the Crystal Award by the World Economic Forum for her services to music education and young artists, the Ernst von Siemens Music Prize, and the German Grand Order of Merit, among numerous others. For more information, visit anne-sophie-mutter.de/en. Tickets, priced $20 to $131, are available at the Carnegie Hall Box Office, 154 West 57th Street, or can be charged to major credit cards by calling CarnegieCharge at 212-247-7800 or by visiting the Carnegie Hall website, carnegiehall.org.